Innovative ‘bring your own battery’ program approved in New Hampshire | NH's energy future is now! The state has approved an innovative program to let people in the Upper Valley install home batteries partly controlled by the local utility, both to trim their electric bills and to help the power grid cope with the changing realities of electricity production. On Thursday, the Public Utilities Commission approved the pilot project proposed by Liberty Utilities. The company will subsidize the cost of between 100 and 200 Tesla Powerwall batteries to be installed in customers’ homes as a test of how well they can be used by Liberty to help cope with peak loads, such as on hot summer afternoons. Liberty says the pilot program is the first in the United States to combine battery storage with time-of-use rates, in which electric charges differ over the course of the day. If all goes well, up to 500 more batteries will be allowed into the program later. The PUC also approved a “bring your own battery” component, which will let private companies such as Sunrun and ReVision Energy install home batteries and participate in the program – often with solar panels added to the mix. Participation by private companies is an innovative component that separates the plan from a groundbreaking program operating in Vermont, where only the utility Green Mountain Power is installing batteries in customer homes. Creating a distributed network of small individual batteries that can be filled up or emptied by the utility, acting as a sort of virtual power plant, is one of the ideas being advanced to help power companies deal with changes caused by solar and wind power and other technical innovations. For example, Green Mountain Power says its distributed-battery program allowed it to save half a million dollars by buying less electricity on the open market during a heat wave last summer. The batteries will also be able to provide electricity during power outages, augmenting or even replacing home generators. They can also trim electric bills by taking advantage of special time-of-use rates that are being created, filling up with cheap electricity at night and releasing it during the daytime, when rates are higher. 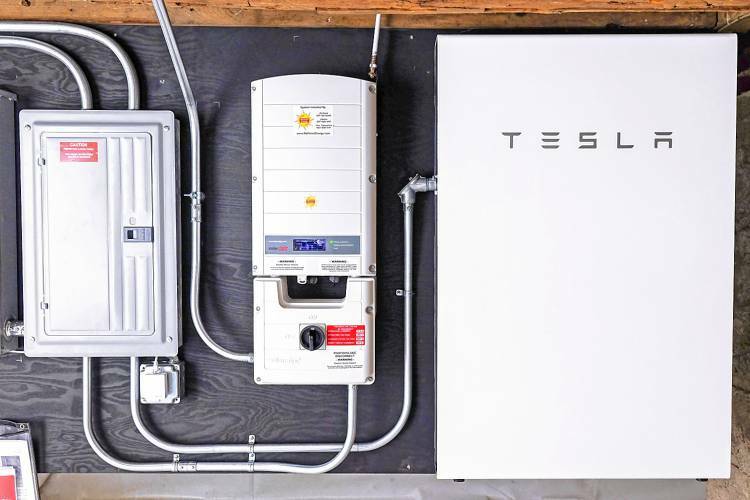 Liberty Utilities will require each homeowner to get two Tesla Powerwalls, which the company says is a requirement from Tesla. The can be leased at $25 per battery per month for the 10-year life of the warranty or $4,866 up front. Cost details have not been released by Sunrun and ReVision. The PUC ruling requires their review of the contract that will be provided to customers and how Liberty Utilities will exlpain time-of-use rates. Once that happens, Liberty says it will begin signing up customers. In New Hampshire, Liberty Utilities provides electricity to about 43,000 customers in 20 towns, m ostly around Lebanon and in southern Merrimack Valley. This electric service area is different than the area where Liberty provides natural gas, which includes Concord. A major weakness of electricity h as always been that is very difficult to store. This means power plants and power lines must be built so that all the power that everybody needs can be generated and transmitted at any given moment, which is expensive. The rise of lithium-ion batteries has changed the equation, making it feasible for the first time to store electricity for future use.